Your computer has power to spare. Copious amounts of RAM, a fast processor, and a capacious hard drive. Developers aren't afraid to use that power, whether or not they really need it. So coming across a frugally-written app that feels like the software equivalent of a tightly wound coil is a novelty. Bvckup 2 is a powerful backup utility that has the pedal-to-the-metal mindset of a command-line tool, but comes with a beautifully functional graphical user interface. Bvckup 2 sports a no-nonsense, informative interface that still feels stylish. Backup is a simple affair, really: Pick a source folder, a destination folder, and your files are copied from the former to the latter for safekeeping. Bvckup 2 sticks to those basics. 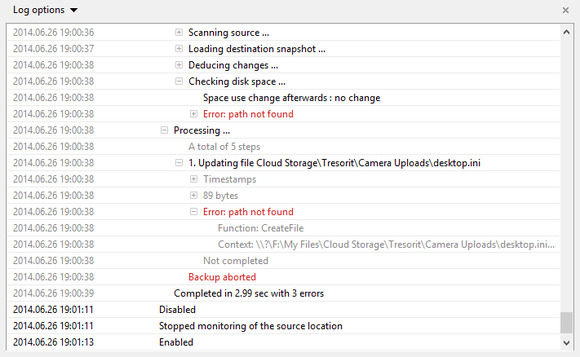 It doesn't back up to the cloud, it doesn't do file versioning a-la Time Machine, and it won't compress your files. It is incredibly fast. Backing up a 7GB VM file to an external USB3 hard drive takes mere seconds, because Bvckup 2 copies only the parts of the files that are different between source and destination. It's easy to tell how your backup jobs are doing. One use I found for Bvckup 2 is to aim it at a data folder of an app I use, then have it copy the data as it changes into a cloud-sync folder. 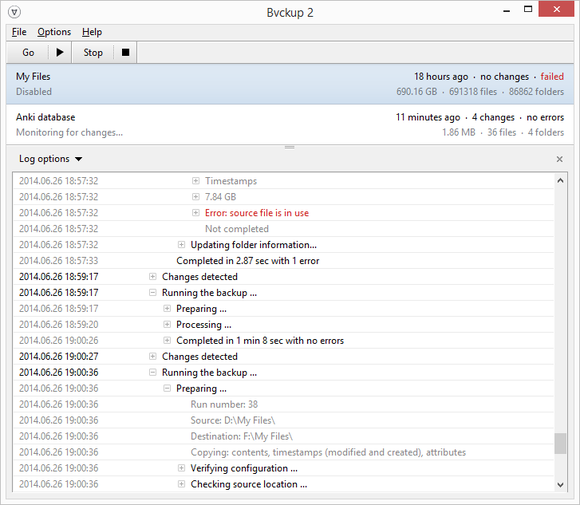 Bvckup 2 watches the file system for changes in real-time, and as soon as a file is modified, it copies it over. This happens even if the app that's using the file is currently running, because Bvckup 2 makes use of the Shadow Copying feature built into Windows. That last part—using Shadow Copying—did not always work perfectly for me, but that's also due to the notorious complexity of this particular Windows feature. There's a log that's built into the app (rather than just as a file on disk), and when Bvckup 2 was unable to back up a file that was locked, the log clearly indicated the problem, so I was not lulled into a false sense of security. Closing the application that was using the file (VirtualBox) let Bvckup 2 get at it. The log is built right into the window, so you don't have to hunt for it. Bvckup 2 is smart about external drives. Say you have an external USB drive that you want to backup to: Most of the time, Windows assigns it the letter F: when you plug it in. So with a batch script or a simpler backup program, you'd just aim at F: and hope for the best. This usually works, unless Windows decides to assign some other drive letter next time you plug in the drive. Instead, Bvckup 2 can track external storage devices according to their unique ID. This way, every time you plug in that particular USB drive, Bvckup 2 detects it and starts backing up to it. This works regardless of the drive letter—and if you connect some other drive and Windows assigns it with F: (or whatever the "usual" drive letter is for that external drive), Bvckup 2 won't be fooled. It knows that's not your target drive, and won't fill it with your files. Bvckup 2 can watch for changes in real time. You can create multiple backup sets for different collections of files, some watching for file changes in real-time and others waiting for you to plug in an external drive. Backups can also run according to a schedule, and you can even have sets that run only when you manually trigger them. The interface is built like a set of nesting Russian dolls: On the surface, you get a list of your backup sets. Each set shows when it was last run, how big it is, and whether or not they were any errors. Drill in, and you'll find the settings. What's interesting is how those are laid out: Not as tabs, but in a folding accordion layout which I haven't seen on any other Windows utility. Backup settings ratchet open, extending the dialog vertically, like tabs you can see all at once. Handling deleted files is always a tricky question when it comes to backup. If you delete a file at the source directory, should it also be removed from the destination, potentially losing valuable work? Or should your backup app just leave it in place, potentially accumulating more and more garbage until the drive is clogged with old and unused files? Bvckup 2 lets you pick either of these options, but adds an interesting third one: It can detect files that were deleted on the source folder, and archive them on the destination folder. Archiving means it just moves them out of the way to a different folder—you can still access them with any file manager. But it also keeps track of them, and can delete them for you once some time has passed: You tell it how long it should wait. There are three ways you can treat deleted files. At the end of the day, backup is serious business. You need tools you can trust, and Bvckup 2 looks and feels trustworthy. It's a compact utility that feels like it was crafted, rather than hastily thrown together to make a release deadline. It clearly communicates your current backup situation, doesn't weigh your system down, and gets the job done. Try it out. A powerful, reliable backup app that won’t weigh down your computer.